Enjoy beautiful Cypress Springs located on Holmes Creek. You can paddle to the spring, eat lunch, snorkel, fish, swing from the rope or just have fun. If you get to the springs and decide to just spend your day there that’s fine with us. With its strong current, lush banks and deep sapphire waters, Cypress Springs is one of the most beautiful springs in Northwest Florida. The spring discharges from two vents in the limestone boulders at the bottom of the spring pool. The diameter of the spring pool is approximately 150 feet and the maximum depth is 29 feet. A large surface boil is visible over both vents. The cool, clear water is a constant 68 degrees Fahrenheit. The banks surrounding the pool are heavily vegetated with cypress and tupelo trees. The Cypress Spring run enters Holmes Creek from the west, approximately .25 miles downstream from the head spring. 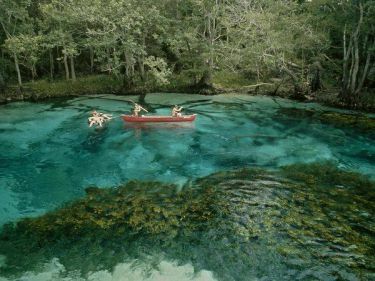 Because the land surrounding the spring is private property, the sole public access to the spring is by traveling up the spring run from Holmes Creek by boat, kayak, canoe, or stand up paddle board.